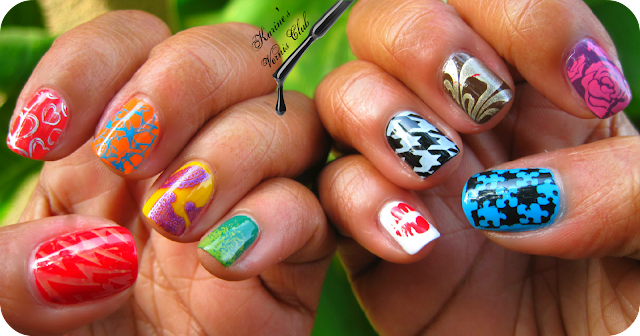 Creative Nail Design by Sue: WOW!! Judging Nail Art is Tough!! This amazing entry by The Nail Buff shows flawless stamping execution. From Karine's Vernis Club, she did a stamping skittle manicure. Here is a pic from her post that shows both hands. She submitted the one on the right to be judged. And lastly, here is Mandy's Polish. What I loved about this was the execution, and, the comparison she did to her first attempt in her blog post. Amazing improvement. I just want everyone to know that the quality of every entry was amazing and hopefully, you will all agree from seeing the entries that it was a tough call. I also want to thank Stephanie from A Little Polish, Victoria from Manicurator and Katee from A Girl and Her Polish for helping my judge. I am glad I didn't have to make the decision alone and grateful that you all put such serious thought into helping me select the winners. Yay! Congrats to the winners! These show some serious skills. Congratulations to everyone!!!!!!!!!!!!!!!! Those were some pretty impressive stamping skills!!!!! To be picked as a winner alongside such amazing nail artists is exciting and flattering beyond words! Thank you so much, and big congratulations to the other winners and participants! Wow congrats they are alll so pretty. Congrats to the winners....all the contest entries were fantastic.